Welcome to the Isle Royale National Park Information Page. Isle Royale National Park is located in Lake Superior, about 17 miles southeast of Grand Portage, Minnesota and about 45 miles north of Copper Harbor, Michigan. The nearest major airport is Detroit, Michigan, there is an airport at Houghton, Michigan. During the summer, visitors can reach the Island via private ferries originating in Grand Portage, Minnesota; Houghton, Michigan; or Copper Harbor, Michigan. A Seaplane service operates out of Houghton, Michigan. Private boaters also visit Isle Royale, often originating from the same locations as the private ferries. Winter headquarters for Isle Royale National Park is located in Houghton, Michigan, on the Keweenaw Peninsula of the “Upper Peninsula” of Michigan. Grand Portage, MN (Wenonah): 3 hours one way. A 65 feet, 149-passenger vessel. Operates June through Labor Day service to and from Windigo. For reservations, see above. Hiking or backpacking; personal boat, canoe, or kayak; Voyageur II shuttle service to selected ports out of Grand Portage MN; M.V. Sandy, water charter service or canoe, boat and motor rental from National Park Concessions, Inc, operated out of Rock Harbor. 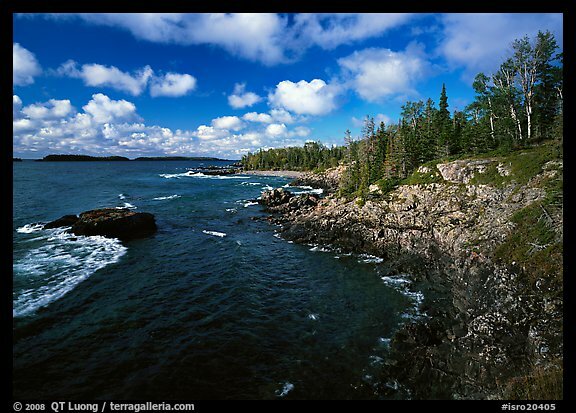 Isle Royale National Park was authorized by Congress on 03 March 1931 by President Herbert Hoover “to conserve a prime example of North Woods Wilderness.” Isle Royale National Park was established on 03 April 1940 by President Franklin D. Roosevelt. The park was designated part of the National Wilderness Preservation System in 1976, under the Wilderness Act, and remains today as an example of primitive America. In fact, over 98% of the land in Isle Royale is designated wilderness. Further honors were bestowed in 1981, when Isle Royale was designated an International Biosphere Reserve by the United Nations, giving it global scientific and educational significance. Isle Royale exists as an island in many ways. It is an island of wilderness and home to wolves in a modern world. It is an island in time, a natural space in which you operate on natural time and experience the rhythms of light and dark. Days are measured by footsteps, possibly under a backpack. Walking the island you are struck by its striated layout, its elongated forested-rock and lake patterns that parallel its backbone, the Greenstone Ridge. The island, it seems, must have been forcibly combed from northeast to southwest. The surface scene you see from the island’s heights is the product of 10,000 years of natural sculpting, soil-building, and plant- pioneering and succession. Back then – actually not long ago by nature’s time scale – the island appeared beneath glacial ice, rising as the lake level dropped. The island developed soil and was colonized by plants and animals. Its many inland lakes first formed in basins gouged out by glaciers and then began to shrink, as lakes and ponds inevitably do. Long before Europeans saw Isle Royale, American Indians mined copper her. Using hand-held beach cobbles they hammered out chunks of pure copper from the hard bedrock. Archeologists have excavated shallow mining pits, some dating back 4,500 years. The French claimed the island in 1671. In 1783, it became a US possession; it was defined as Chippewa Territory until 1843. Modern copper mining took place off and on from the mid-1800’s until 1899. During that era large areas were burned, the forest was logged, and settlements developed. The 1700’s saw the advent of commercial fishing. The American Fur company used the ancient method of gill netting to take whitefish, lake trout, and siskiwit. This tradition has been handed down through the fishermen’s families. Early this century Isle Royale became popular for summer homes, excursions, and as a wilderness retreat. Detroit journalist Albert Stoll sparked the fight for the national park, which was established in 1940. Isle Royale is largely a wilderness area. When planning a visit, recognize the wilderness mandate of the park and that there are topographic, vegetative, and physical obstacles that might require you to have assistance. The park is perhaps ideal for the adept mobility impaired person that can experience the wilderness resource via canoe or sea kayak. For a free brochure on accessible facilities and services that the park offers, contact the park at 906-482-0984. Any visit to Isle Royale will require substantial planning. Reservations need to be made on a passenger ferry or seaplane to reach and return from the island, or visitors will need to pilot their own boat to the island. Equipment choices will depend on whether or not the visit will include backpacking, canoeing, kayaking, power boating, using lodging facilities, and other options. Timing of the visit will correspond with more crowded (late-July through August) or less crowded (April through early July and September through October) periods. Boaters have been coming to Isle Royale to enjoy the clean clear waters, the protected harbors and bays, the dramatic shorelines, and the excellent fishing for more than 100 years. Many Isle Royale boaters make repeat trips to the island, and some can trace their island connections back for generations. Even first-time visitors can feel keen appreciation for the resources and values of this one-of-a-kind maritime park. Isle Royale National Park was authorized by Congress in 1931 “to conserve a prime example of North Woods Wilderness.” The park was designated part of the National Wilderness Preservation System in 1976, under the Wilderness Act, and remains today as an example of primitive America. In fact, over 98% of the land in Isle Royale is designated wilderness. Further honors were bestowed in 1981, when Isle Royale was designated an International Biosphere Reserve by the United Nations, giving it global scientific and educational significance. Wilderness is managed for preservation and solitude. We need such natural places for study, measuring the forces of natural change and dynamics, and as a place to renew the human spirit. Isle Royale has established rules and regulations governing group size, fires, sanitation, and basic conduct to help protect its varied resources as well as the quality of experience for users. Help preserve wilderness by following these guidelines. The park charges a $7 per person daily entrance fee. It is charged to enter or remain within the park per calendar day. The Isle Royale Season Pass costs $60 and will cover up to 3 people traveling with the pass holder (4 total) for all visits during the entire 2017 season (April 16 through October 31). The $150 season boater rider pass has been discontinued. Boaters may purchase the $60 Isle Royale Season Pass instead. All Federal Recreation Passes (Annual, Military, Senior, Access, and Volunteer) are now honored. Entrance fees will be waived for the pass holder and up to 3 adults traveling with the pass holder (4 total). Children 15 and under are exempt from the daily entrance fee. The entrance fee for Isle Royale National Park applies to all park visitors, except for children 15 and under. It is a fee to enter or remain within the park charged per person per calendar day. This includes the day you arrive and the day you depart the park. Lake Superior Waters: The Michigan Department of Natural Resources regulates fishing within the Lake Superior waters of Isle Royale National Park. A Michigan fishing license is required and all Michigan size and catch limits apply. Inland Lakes and Streams: No fishing license is required to fish the inland lakes and streams of the park. Only artificial bait and lures may be used. No living or dead minnows, worms, leaches, insects, fish eggs, or food may be used. Michigan open seasons, size and possession limits apply with the exception of park-specific restrictions for brook trout. Check with a ranger for additional information. The marina at Rock Harbor Lodge is open from approximately mid-May through mid-September and offers diesel fuel, gasoline, and oil. Boats up to 65 feet long can be accommodated, along with 110V A.C. electrical and fresh water hook-ups and pumpouts. Motor boat and canoe rentals by the half or full day or week are available. A gift/snack shop, lodge dining room, and marina grocery store at Rock Harbor offer souvenirs and gifts, camping and fishing supplies, laundry facilities and showers. One hundred sixty-five miles of hiking trails accessible from numerous points around the island connect all campgrounds except those accessible only by boat. Off-trail travel is permitted, but difficult because of dense vegetation, bogs, and swamps. Numerous lakes, bays and islands provide good paddling opportunities for canoes and kayaks. Overnight docking and “anchoring out” at selected areas are available for motorized vessels (sailboats and power boats). Tent sites for one to three tents and three-sided shelters (maximum six people) are available on a first-come first-served basis. Group campsites, for parties of seven to ten people, require advance reservations. Email ISRO_GroupReserve@nps.gov for group camping information and reservations. Long term campground stays are not available and limits are in effect from 01 Jun through Labor Day. Dogs, cats, and other pets are not allowed within the park boundaries, including pets on boats. Visitors bringing pets to Isle Royale will be required to leave immediately. Pets can disturb wildlife and be a source of disease (such as canine parvovirus), particularly for park wolves. Visitor centers are located at Rock Harbor and Windigo. Exhibits at visitor centers and at Rock Harbor Lighthouse explore local natural and cultural history topics. Other historic landmarks accessible by sightseeing cruises include Edisen Fishery, Passage Island Lighthouse, and the Minong Mine. Lake Superior weather is cool throughout the year. Dense fog in spring, sunny with temperatures rarely exceeding 80 F. Thunderstorms and rain occur throughout the season. Weather and rough seas may delay departures to and from the island. Bring plenty of warm clothing, even in August. A jacket is a must for the ferry trip to the island or if boating around the island. Summers are cool and winters are very cold; periods of warm summer temperatures rarely exceed 2 to 3 days in length. Day to day temperature changes are strongly moderated by the surrounding waters of Lake Superior, the coldest of the Great Lakes.